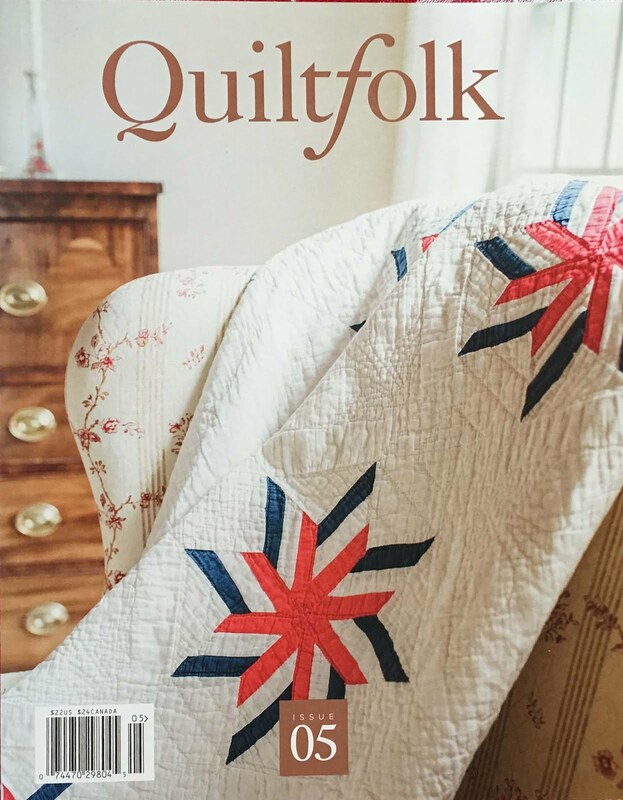 Here's is Part Three of my home town show-- Bayberry Quilter's of Cape Cod. These are some of my particular favorites which kind of defy classification as pieced or appliqued. All hand done. Need I say more. This wonderful modern quilt was started in a guild class with Weeks Ringle-- beautiful matchstick quilting-- Finished AND Perfect! Thread painting eye candy. Just look at that eye. A map quilt is SO on my bucket list. Thumbs up, ladies. I'm crazy about Crazy quilts! A nod to machine embroidery. Well done. I used to spend my time, commuting 2 hours back and forth to NYC, cross stitching. What a wonderful way to frame this piece. Shall I dig out some of my cross stitch UFOs? My vote for best in show!! LOL-- the Bayberry Guild has a FREE table to share unwanted fabric, etc-- I loving laid my Circus test stitch outs to rest last year, after figuring out my kids, now in their twenties, are no longer interested in a potential circus quilt. Maryanne took it from there-- yes, finished and perfect, again! Thanks for the thrill, dear. Our guild challenge this year was SEASONS! Quilters were free to interpret the seasons through fabric and color. All quilts were required to hang vertically and measure 18 inches on the top and bottom and 36 inches on the sides. All awards were viewer's choice, and so the artist's names were not revealed-- comment below and I will gladly post them if you know whose they are. Oddly, a group with homes on Cape Cod overwhelmingly selected WINTER for the theme. Go figure. In New England, we are also fortunate to host Mancuso's World Quilt New England show in Manchester, NH in August-- it is one of my favorites and brings in quilts from all over the world. Of course, I didn't miss it-- so come back soon for more quilty eye candy! 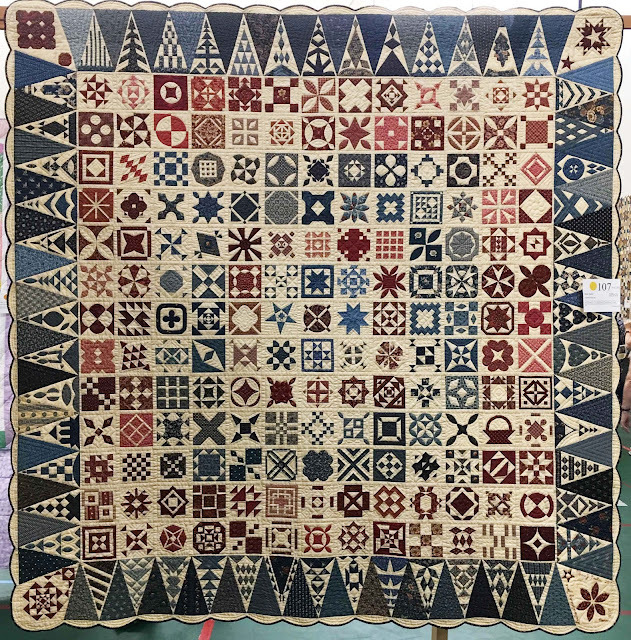 This is Part 2 of posts on our local quilt guild, Bayberry Quilters of Cape Cod, show. Today we're looking at applique quilts. Artists always pick nice places to live-- and Cape Cod is at the top of the list, so there's incredible bench strength in this club. This amazing and very unusual piece was front and center as you walked into the show. LARGE! It was all done with meticulous, buttonhole machine applique-- just look at those shapes-- and took a number of years. The colors are just really out of the box as well. Stunning. This is by my friend Kathy, who has done many amazing things in a lifetime including retiring to be a ski instructor. She added bits 'n bobs of her grandmother's jewelry and other family mementos in this piece that just says L-O-V-E. This quilt is not only amazing for being Baltimore, but also has many 3D flowers which I always love. Perfect and beautifully quilted as well. I have never met Anne, but I HAVE seen her quilts! She is productive, and has won Best in Show before. I just love this folksy quilt-- not sure if it is a pattern, but the blocks are so cute and the orange peel pattern is so fabulous, too. Look at the little scene in the close up below. Broderie perse beauty, fully embroidered as well. This is quilted by the famous Margaret Solomon Gunn of many, many show ribbons, and did not disappoint. The show always commemorates members we've lost in the past year-. Each had a quilt or two In Memoriam, and they will be treasured by family members forever. I always love a pretty mix of piecing and applique-- another Anne Messier for the year! A favorite theme for me-- on my bucket list. The next three are less traditional applique, but no less fantastic. I guess you'd call me a fan because I am always drawn to Cathy's quilts-- always so original and mostly Cape themed. What's not to love? The center panel of a lovely triptych, which also won a blue ribbon for Laurie. Look at the face on that little frog! I also LOVE when quilting becomes more that a pattern and tells more of the story-- see the butterfly and flowers in the "distance"? All a quilt should be-- you can tell just by looking, this was made for someone special, who will grow up to love trucks, cars, and football. Sweet dreams, little one, under this quilt. You are loved. And here's our Best in Show! I'm sure you've all ogled this gorgeous pattern by Sue Garman-- and here it is, living up to its full potential. Tere not only hand-turned appliqued but quilted this by herself, too! It's her second best of show in three years-- she is incredible. 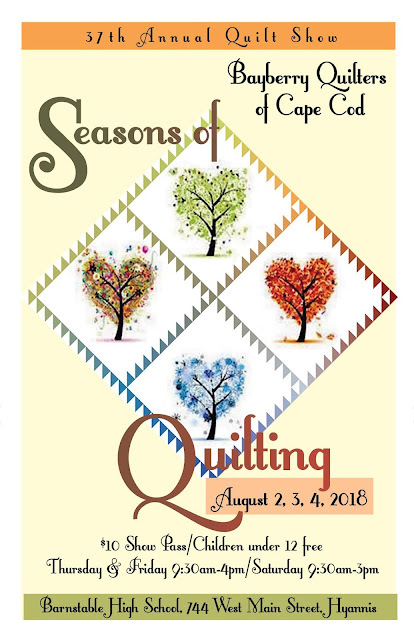 For my last post, I am going to show you some very special quilts which defy classification as pieced or applique, and also the "Seasons of Quilting" Challenge quilts, so be sure to look for that next week. Hope this inspires you to pull out at UFO this weekend. Quilting rock star Laurie had no less than six pieces in the show-- this is Tula Pink's pattern and Laurie's version here went on to win a blue ribbon. Laurie uses the most amazing quilting patterns-- simple but sensational-- makes it look easy and effortless when we all know it isn't! just look at the little houses, and the simple stars! Great modern quilt-- again, one of six Laurie finished this year! Quilted by Marjetta Gladding. This is the Urban Owls pattern by Wendy Williams- a local quilt shop had a stitch-a-long for it. I though we would see more, but this person is the apparently the only one finished! LOVE the purple, and the name. Love that snails trail block. A friend of mine pointed out I have a teal fetish going right now... guilty as charged. I believe this is Sue Garman's block of the month done for The Quilt Show. What a credit to Sue that her patterns live on. And a credit to Noreen for finishing this amazing heirloom. Vi was a featured quilter and had 25 quilts on display, each one incredibly unique. I don't think I've ever finished half that amount! Beautiful modern quilt-- straight line quilting-- simple and sensational. A spool quilt is on my bucket list-- my fabrics aren't as sensational as these, though! I think you'll agree this guild has a ton of talent... not to mention people who finish things! LOL Stay tuned-- next post will be devoted to gorgeous applique.